Fatman iTube 182 / iTube dock review | What Hi-Fi? 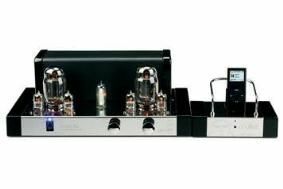 Q: When is a £500 amplifier not a £500 amplifier? A: When it comes bundled with one of the best iPod docks around. A small difference, but one that makes for even better value for money. Build quality is first rate, with the retro valve technology contained within a shiny, solid body. The cage-like front piece has the double effect of protecting the delicate valves, while also looking incredibly stylish. Plus, it lets the heat from the valves escape, because unlike most modern amplification, this baby runs hot. It has three line-level inputs and an interesting selection of speaker outputs: each 18w channel is fed by three sockets, so you can drive your speakers at 4 or 8 ohms. There's no remote for the amp, though the dock's zapper lets you navigate your iPod. This is a musical and enjoyable listening companion. It's easy to pick out the separate strands of Stevie Wonder's Sir Duke, but rather than being overtly analytical, the Fatman presents the sound as a cohesive and coherent whole. Vocals sound impressively natural, as does the tricky timbre of massed brass. Meanwhile, with considerately ripped tracks the dynamic duo does MP3 proud. But be warned: scrimp on bit-rates and this system is good enough to make the error of your ways all too obvious. This iTube 182 would be a very fine purchase even without the dock. It's walking a line between being the best iPod system we've heard, and an impressive £500-worth of stereo amplifier – even for those who would rather melt their LPs than listen to MP3.